Students and staff at Glasgow Caledonian University’s Cowcaddens campus celebrate receiving the Cycle Friendly Campus Award from Cycling Scotland – the first of its kind in Scotland. The award, which is delivered with funding from Transport Scotland, recognises the efforts of Scotland’s colleges and universities that promote cycling as an accessible and convenient travel choice, was presented to Gerry Milne, GCU’s Vice-Principal Infrastructure, and GCU’s Sustainability Officer Paulo Cruz by Keith Irving, Cycling Scotland chief executive in recognition of the outstanding level of commitment the University has shown to encourage cycling to, from and around campus. GCU implemented a range of measures, including bicycle parking, cycle training, linking with Glasgow’s cycle hire scheme and providing personal travel planning – all of which has led to an increase of almost 20% in the number students, staff and visitors choosing to travel to campus by bike since the start of the project in the autumn of 2014. The University also partnered with Glasgow Bike Station to deliver their student focussed Uni-Cycle project. Derek Mackay, Minister for Transport & Islands said: “I’d like to congratulate Glasgow Caledonian University on receiving the first ever Cycle Friendly Campus Award and doing so with distinction. “GCU is delighted to be named Scotland’s first Cycle Friendly Campus - we want all those who cycle to and from the University to get the most out of life on two wheels. “We have introduced a range of initiatives to encourage and promote cycling and its many benefits, from free bike maintenance sessions and breakfasts to cycle training and personal travel plans, as well as increasing bike parking on campus. Paul Wright, Cycling Scotland development officer said, “Cycling Scotland has worked closely with Glasgow Caledonian University, both in the pilot project and in working towards receiving the first ever Cycle Friendly Campus Award. 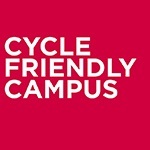 The Cycle Friendly Campus Award is run by Cycling Scotland with funding from Transport Scotland and recognises exemplar projects from Scotland’s college and university campuses where cycling is a real and accessible part of campus life.